New Con­structs’ stock picks are reg­u­larly fea­tured by Barron's, CNBC, SumZero and other experts. Details here. We assign one of five ratings to every stock under coverage: Very Attractive (best rating), Attractive, Neutral, Unattractive, Very Unattractive (worst rating). These same ratings apply to ETFs and mutual funds. Ratings are based on the 5 most important criteria for assessing the risk versus reward of stocks. Those criteria are divided into two categories: “Business Strength” and “Valuation”. Our uniquely rigorous diligence in footnotes helps protect clients from stock blow-ups. A) Busi­ness Strength: the qual­ity of the eco­nomic earn­ings of the com­pany and the strength of its busi­ness model based on its ROIC. 1. Qual­ity of Earn­ings mea­sures how reported account­ing income com­pares to the economic earn­ings of the company. 2. Return on Invested Cap­i­tal (ROIC) mea­sures the aggre­gate cash on cash returns of the company. B) Val­u­a­tion: based on the expec­ta­tions embed­ded in stock prices. Investors should buy stocks with low expec­ta­tions. 3. Free Cash Flow Yield mea­sures the true cash yield of the company. 4. Price to Eco­nomic Book Value mea­sures the growth expec­ta­tions embed­ded in the stock price. 5. Market-Implied Dura­tion of Growth (Growth Appre­ci­a­tion Period) mea­sures the num­ber of years of future profit growth required to jus­tify the cur­rent val­u­a­tion of the stock. 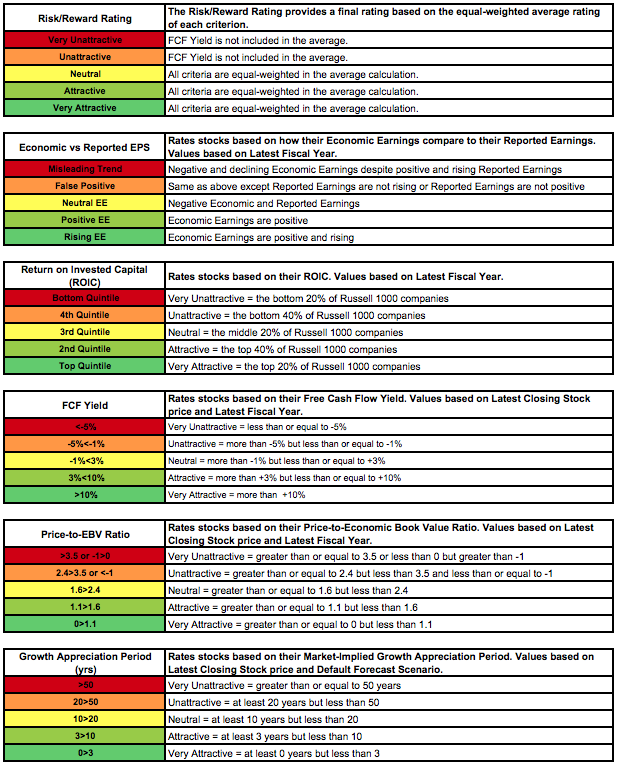 Figure 1, the New Constructs’ stock rating table, shows how the criteria above translate into our rating for every stock, ETF, and mutual fund we cover. You will find Figure 1 in every one of our Company Reports as well as many of our reports on ETFs and mutual funds. For more explanation behind the thresholds that drive the Predictive Rating, see Figure 4 at the end of this post. To illustrate New Constructs’ stock ratings in action, below are the explanations behind how stocks make our monthly Most Attractive Stocks and Most Dangerous Stocks lists. For details on the performance of our Most Attractive and Most Dangerous Stocks since 2005, please see Proof Is In Performance. Economic Earnings/Cash Flows that are positive. Growth Appreciation Periods (GAP) that are relatively low. The above characteristics also qualify stocks for a ‘Very Attractive’ or ‘Attractive’ Rating, according to our stock rating system. Figure 2 below shows our stock rating table, which we include in the reports for each of the 3000+ companies that we cover. Stocks get a grade of 1 to 5 for each criterion, 5 being the worst and 1 being the best score. The Overall score is based on the average score of all five criteria. Stocks must get an average score of 1.4 or below to be rated Very Attractive. For the most part, only Very Attractive stocks qualify for our Most Attractive Stocks lists. Low Returns on Invested Capital (ROIC). Growth Appreciation Periods (GAP) that are relatively high. The above characteristics also qualify stocks for a ‘Very Unattractive’ or ‘Unattractive’ Rating, according to our Risk/Reward Rating system. Figure 3 below shows our stock rating table, which we include in the reports for each of the 3000+ companies that we cover. Stocks get a grade of 1 to 5 for each criterion, 5 being the worst and 1 being the best score. The Overall score is based on the average score of all five criteria. Stocks must get an average score of 4.25 or above to be rated Very Unattractive. For the most part, only Very Unattractive stocks qualify for our Most Dangerous Stocks lists. Figure 4 provides additional detail and explanation behind our stock ratings and the criteria and thresholds that drive them. Free-Cash Flow Yields measure the % of the total value of the firm for which the Free Cash Flows of the firm account. The formula is FCF/Current Enterprise Value. Economic Book Value (EBV) measures the no-growth value of the business based on its annual after-tax cash flow. The Formula for EBV is: (NOPAT / WACC) + Excess Cash + Non-operating assets – Debt (incl. Operating Leases) – Value of Outstanding Stock Options – Minority Interests. Growth Appreciation Period measures the number of years, implied by the market price, that a company will grow its economic earnings. This measure assigns a numerical value to the width of the moat around a firm’s business.